Don’t be daunted by the graduate job application process. Applying for jobs is a skill that can require practice, but you can master it! We can help you to articulate your skills and turn a good application into a brilliant one! Slow and steady wins the race – Don’t rush in, read through everything and make a plan. Take your time and make sure you get your application checked before clicking submit. Be specific – Talking about your skills is great. But backing them up with evidence is essential. Use the STAR technique to structure your examples. Be creative – Just because it seems like your part-time job or voluntary work isn’t related to your career aspirations, don’t dismiss it! We can provide advice and support to help you through every stage of the recruitment process. Drop in to see us in the Career Studio on University Square or look out for our pop-up Career Studio on campus Monday 18th February 12pm – 5pm in the reception area of the Walker Building (Engineering). Can’t make it in? Ask us a Question via our website. Have a look at our online resources – these include everything you need to know about application forms, an application form checklist, and guide to writing personal statements for postgraduate study. 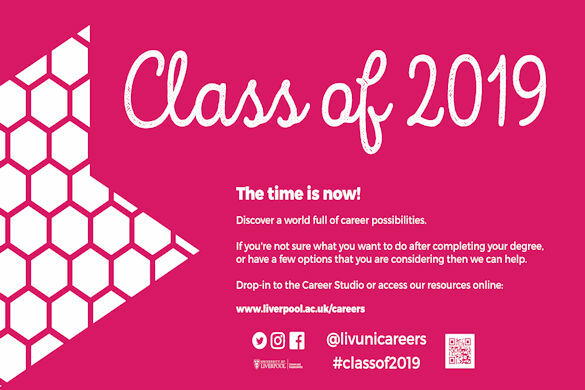 Make sure you don’t leave it too late – #Classof2019 – The time is now!